The WINDSOR CHARIOT2 IGLOSS20 is a battery powered stand on burnisher. 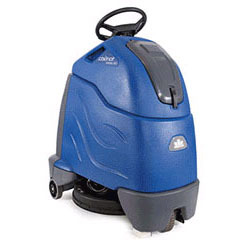 This unit increases productivity and cleaning quality with its patented stand-on cleaning technology. The compact design is ideal for small areas and storage. The control system has pre-set cleaning settings that simplify training and provides more consistent cleaning results. The WINDSOR CHARIOT2 IGLOSS20 also has a convenient disposable bag that collects the dust which improves the indoor air quality.